Pho isn’t any ordinary noodle soup. The broth is painstakingly made over several days, utilizing every piece of the protein to create a broth that is so rich in flavor that there are few other things like it in the world. Where can you experience these authentic flavors? At any of the 10 best pho restaurants in Maryland. Man-Vs-Pho is known for two things: having the best hangover food in Catonsville and their man-vs-pho challenge. Two pounds of meat. Two pounds of pho noodles. One half hour to get it all in your belly. Can you do it? Good luck. Cam Ranh Pho and Grill offers authentic Vietnamese flavors to Wheaton, Maryland. The head chef has over 30 years of experience, adding a depth of knowledge to his flavors. The menu includes six kinds of pho available in small and large. Pho Nom Nom has a location in Rockville, Maryland and Fairfax, Virginia. They offer “authentic Vietnamese cuisine, specializing in pho, banh mi, noodles and grilled dishes.” Choose from 14 house recommendations or customize your own pho dish. Interested in a modern pho experience? Then you simply must try Pho Tan Vin. This Silver Spring institution brings a modern design sensibility to its authentic flavors, making it a delight to visit. 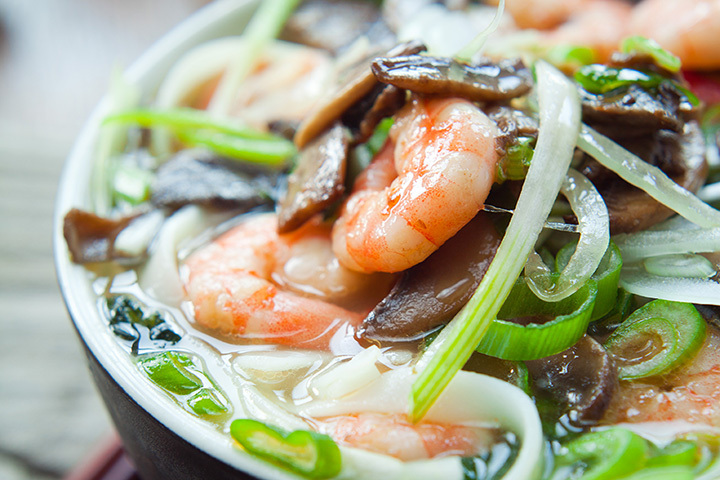 Pho 7 Rich prides itself on its healthy Vietnamese food. They were the first Vietnamese restaurant in the area and continue to deliver healthy, delicious dishes on a daily basis. Try any of their 11 options; you can’t go wrong. An Loi in Columbia, Maryland “was established so you can enjoy exotic food in our comfortable dining room right here in central Maryland.” Their specialty? Pho. With 12 delicious options to choose from, you’ll want to come back again the next day. Pho and Grill, in Gaithersburg and Olney, let’s their food speak for them. Start the meal off with an order of shrimp toast. For your entrée, we recommend blindly picking any of their eight pho dishes. That’ll add a bit of mystery to your meal and make sure you order something delicious (spoiler alert: they’re all good). Pho Kevin in Laurel, Maryland describes their food as “varied and seductive,” having developed over generations until developing the perfect depth of flavor. As you may have guessed, their menu is primarily pho with 15 options to choose from. Pho Basil brings the Vietnamese culinary revolution that is pho to Frederick, Maryland. Eat or take out; they deliver within three miles of the restaurant. If you can only choose one of their 19 pho options, we recommend a mix of white and/or dark meat chicken. V N Noodle House Vietnamese restaurant is downright tasty. You know the kind of place that has you craving your next meal even while you’re still eating this one? That’s what we’ve got here. They’ve got 12 delicious options. Go nuts. They’re all great.